We are all suffering from information overload and none more so than those in Green Procurement. It's impressive to have all the certifications, accreditations, ecolabels, stars, ticks etcetera, but it's sometimes hard to see the wood for the trees. The introduction of Environmental Product Declarations (EPDs) looks set to differentiate products and provide clarity in procurement. It will be interesting to watch the businesses that are setting the new benchmark with published EPDs. A published EPD is an independently verified and registered document that communicates transparent and comparable information about the environmental impact of a product through its entire life cycle. Data reported in an EPD is collected using internationally recognised life cycle assessment methodology and ISO 14025 principles and procedures. It's somewhat like a nutritional chart for a product providing relevant information from raw material extraction to final disposal. The product's whole value chain is analysed and reported upon. One benefit for businesses is the reduction of risk. By demanding EPDs on specified products, a business can ensure it understands the embodied energy and impact of the product it is procuring. And so, reduce the risk of any unexpected surprises and protect the reputation of their brand. By having all the information, businesses can make choices on what is most important to them. For instance, businesses aiming to reduce their Scope 3 GHG emissions can use EPDs to identify products produced using high percentages of renewable energy to reduce their carbon footprint in their supply chain. Overseas, EPDs are becoming commonplace. And within the construction industry in Australasia we are seeing more and more requests for products with EPDs through tenders. Other B2B brands are now picking up the trend. Tork Professional Hygiene products have recently become the first hygiene products with EPDs in Australasia. Their most popular toilet paper and hand towel products were the first to be assessed. That Tork is leading the way is not surprising, considering parent company, Asaleo Care has declared a commitment to being a sustainable business with transparent and open communications about environmental practices. "We were attracted to EPDs because of their transparency, credibility and ability to speak to the product's entire life cycle. EPDs for tissue products are unique in our Australian and New Zealand markets, and unlike our competitors, we have both quantified our environmental impacts and disclosed this information publicly for a range of products," said Sid Takla, Executive General Manager B2B, Asaleo Care. 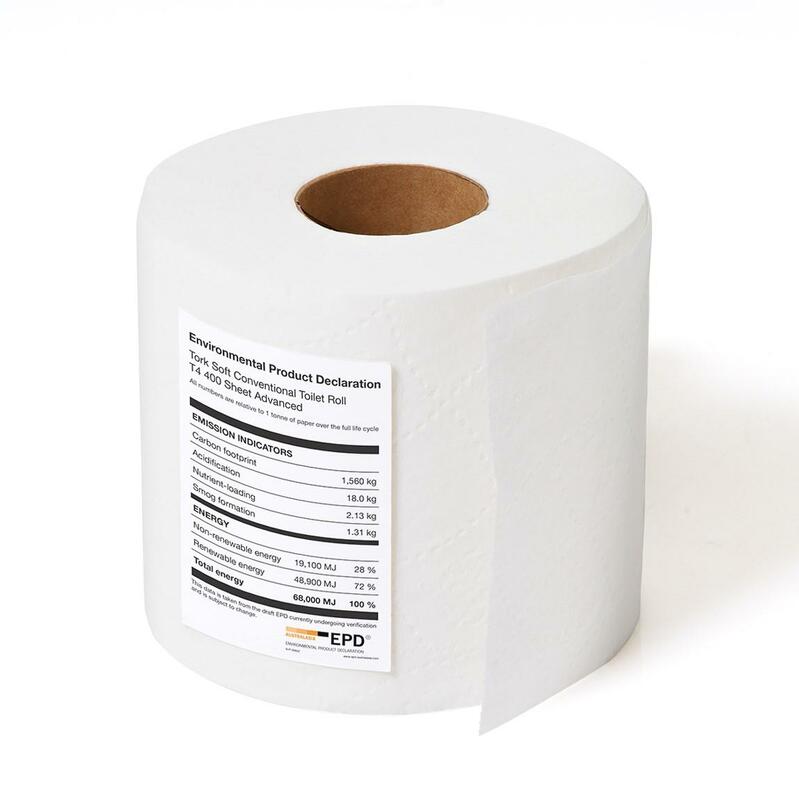 "EDPs will also allow us to identify hot spots within our value chain - areas where improvements can be made to reduce impact"
Through the life cycle assessment, Tork Conventional Toilet Paper has been identified as having been produced with 70 percent renewable energy. An achievement that is a result of the direct use of geothermal steam in the paper making process and also of New Zealand high proportion of renewable energy within the grid. Coupled with the sourcing of raw materials from 100 percent responsibly managed forests, the data in the EPD paints an impressive picture for Tork. The EPDs for Asaleo Care were produced by thinkstep Australasia. They have been operating in the sustainability market for over 20 years and work with roughly 40 percent of the Fortune Global 500 companies. Barbara Nebel, Managing Director of thinkstep Australasia said, thinkstep congratulates Asaleo Care on being first to produce an EPD for tissue paper in Australia and New Zealand. It shows their commitment to fact-based disclosure of environmental information in a concise and substantiated way. At the end of the day, an EPD gives a decision maker in Green Procurement an immediate, reliable and quantitative way to evaluate a product. Its embodied energy, global warming potential, use of natural resources, emissions to air, soil and water, and waste generation are all available for review. The level of transparency an EPD provides is unprecedented and will change the environmental assessment landscape forever.